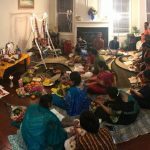 Houston GOD Satsang celebrated Janmashtami on Aug 15 at the residence of Sri Sriram Ramanujam and Smt. Nisha Giri. 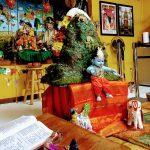 The event started off with Mahamantra kirtan followed by kirtans on Krishna. 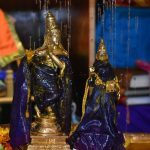 Then Sriramji gave a short introduction to the beautiful Pancha Gitams from Srimad Bhagavatam, following which Parayana of the five Gitams was performed by all the devotees (about 40 in total). 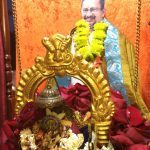 The parayanam of each Gitam was preceded by a brief explanation about the Gitam and its meaning by Nishaji. The parayanam was followed by a short discourse by Sri Narayan Daveji on Srimad Bhagavata Mahatmyam. He also talked about how the slokas have three meanings – pada artha, tattva artha and bhava artha. Then the devotees sang some kirtans before taking a short break for lunch prasad. The gathering reconvened for another kirtan session after lunch, which lasted for over an hour. 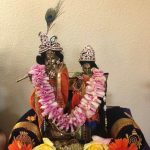 The Janmashtami satsang was followed by the biweekly Houston Srimad Bhagavatam study circle, where the parayanam of Dhyana slokas and Kunti stuti was performed followed by a discussion of the meaning of some slokas from Kunti Stuti. 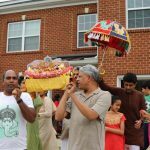 When the day finally came to an end, all devotees left happy and satisfied after spending over six hours singing and talking about the glories of the Lord. The devotees took home a copy of Sri Sri Swamiji’s Pancha Gitam CD and a booklet with the lyrics of the verses.